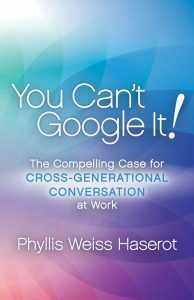 Phyllis Weiss Haserot is a passionate champion of improving relations among the generations in the workplace to help organizations solve sensitive intergenerational challenges that can hinder productivity, client relationships, knowledge transfer, succession planning, and business development results. Phyllis is the author of YOU CAN’T GOOGLE IT! The Compelling Case for Cross-Generational Conversation at Work, in which she shares the experiences and insight that have both shaped and been shaped by nearly three decades of coaching and consulting. 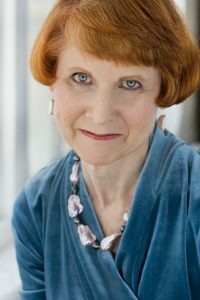 As president & founder of Practice Development Counsel, Phyllis works with organizational teams and leaders to improve productivity, employee retention, and business development results by restructuring the workplace and adjusting business models to work better for professionals and executives, staff, and their clients of all generations. Having been a trailblazer for her entire career, Phyllis knows the keys to results are facilitated dialogues and authentic conversations -- the only solutions to sort out issues in the workplace and spark real change.